Golden sponge with raspberry jam and buttercream filling, decorated with sugar-paste parcels and streamers. Streamers should be removed before serving. 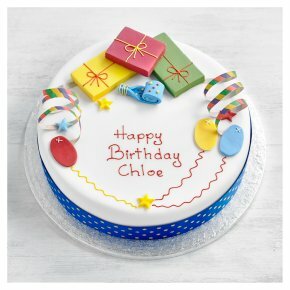 You can personalise this cake with a hand-piped message of up to 36 characters, including punctuation and spaces. Paper streamers and ribbon are not edible and should be removed before cutting and serving.